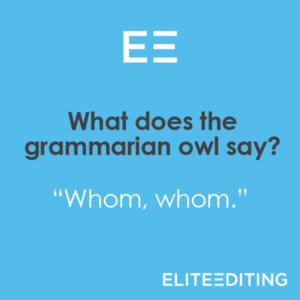 Q: What did the well-educated owl say? And knowing when you should use who and whom is as easy as She Loves Me (Yeah, Yeah, Yeah). Or, if you prefer, And I Love Her. Just keep humming; we’ll explain. Just like she and me in She Loves Me, or I and her in And I Love Her, who and whom are pronouns—sometimes interrogative pronouns (which means they’re used to ask questions) and sometimes relative pronouns (which means they’re used to make relative clauses). Who (like she and I) is the subject form; whom (like her and me) is the object form. So you use who when you want to know the subject of the verb and whom when you want to know the object of a verb or preposition. So how do you use who and whom? You probably already know how to use who in a sentence. You use who in questions when you want to know what person is doing something—that is, when you want to discover the subject of the verb. Who sang “Unbreak My Heart”? Who threw the ball that broke Carol’s stained glass window? Who ate my leftover spaghetti and meatballs? The trickier question is this: How do you use whom correctly in a sentence? Use whom in questions when you want to know what person something is being done to—that is, when you want to figure out the object of the verb. You should also use whom when you are asking about the object of a prepositional phrase. Whom did the vampire attempt to bite? Whom did Franklin say he killed? You can also use whom when you’re trying to find out with or to or from or before or behind which person something is happening. These are all prepositions, and prepositions take objects (which is why something is always between you and me, and not you and I). From whom did you buy this one-trick pony? With whom is Harold going to the Metallica concert? Against whom will you be competing in the luge? To whom did you expect to give this ridiculously large sweater? 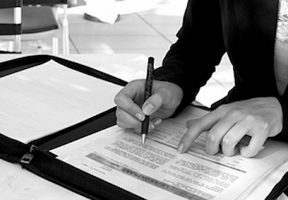 A relative clause is a subordinate clause (which simply means it can’t stand on its own as a sentence) that (1) starts with a relative pronoun (such as who or whom) and (2) offers more information about the noun (or phrase or even clause) that it follows. 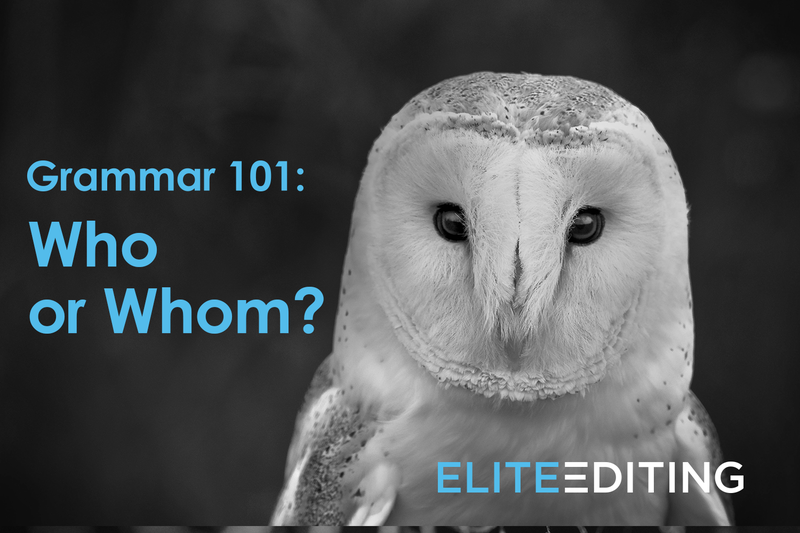 So when should you use who and whom in relative clauses? Use who in relative clauses when it’s the subject of that clause. My mother, who sews quilts for a living, just joined a roller derby team. 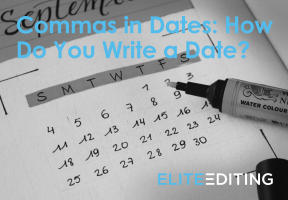 Any writer who uses relative pronouns correctly will make her editor happy. Naomi and Ronald, who just moved in next door, have seven dogs. Use whom in relative clauses when it’s the object of that clause. Eliza Schuyler, whom Alexander Hamilton married when she was just twenty-three, lived to be ninety-seven years old. The man whom I met while skydiving in the Amazon turned out to be a Russian spy. Bill, whom my dog bites every time he visits, now has a permanent limp. Many quantifiers (a word or phrase used to indicate number or amount) in English can be followed by the preposition of, and since whom is the object form, these quantifiers should all be followed by whom. Professor O’Leary has many students, most of whom love her. George and Martha have two children, both of whom are blond. Parliament-Funkadelic has dozens of members, all of whom also perform with other groups. Many brave knights venture into the cave of dragons, few of whom ever return. Pro tip: Because people are countable, always use the countable quantifiers: many of rather than much of and a few of rather than a bit of. Not Sure about Who vs. Whom? Use the He/Him Test! When you’re not sure whether to use who or whom in a sentence, use the he/him test. Here’s how it works. When you’re not sure whether to use who or whom, substitute he or him (sometimes by answering the question), and see which is correct. Who vs. Whom? Round 1! The boy [who/whom] my mother made me call is a dweeb. My mother made me call [he/him]. Since you’d use him in the test sentence, you should use whom in the original sentence. The boy whom my mother made me call is a dweeb. Who vs. Whom? Round 2! My father, [who/whom] is Sicilian, spends all his free time growing tomatoes. Since you’d use he in the test sentence, you should use who in the original sentence. My father, who is Sicilian, spends all his free time growing tomatoes. Who vs. Whom? Round 3! [Who/Whom] wants to eat the last brownie? [He/Him] wants to eat the last brownie. Who wants to eat the last brownie? Who vs. Whom? Round 4! [Who/Whom] are you interviewing for this position? Whom are you interviewing for this position? Whoever and whomever are pronouns that follow exactly the same rules as who and whom—that is, whoever is a subject pronoun, and whomever is an object pronoun. Whoever and whomever are a bit more vague than who and whom and mean something like “any person who” or “the person or people who.” But how do you know when to use whoever vs. whomever? 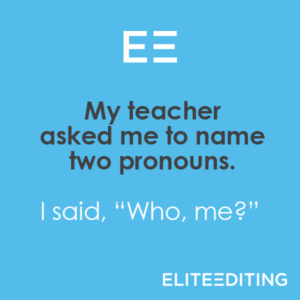 Whoever is a subject pronoun and works like I, he, she, we, and they. Whoever baked this amazing chocolate cake is my new best friend. I want to give this pile of cash to whoever needs it most. Whomever is an object pronoun and works like me, him, her, us, and them. I will happily give detention to whomever I spy lingering near the punch bowl. That is between me and whomever I decide to marry. The tricky bit here is that whoever and whomever often meet at the intersection of two clauses, and sometimes the pronoun seems to be the object of one clause but the subject of another. So how do you decide which to use, whoever vs. whomever? Whomever vs. whoever? Try covering up everything before the pronoun and then using the he/him test. Since he is obviously correct, the right relative pronoun is whoever. I spy [he/him] lingering near the punch bowl. Since him is correct, the right relative pronoun is whomever. Pro tip: Whoever is used far more often than whomever, so if you’re really stuck on whoever vs. whomever, use whoever. How Well Do You Know Who and Whom? Think you’ve mastered the gauntlet of who vs. whom? Test yourself and see! Karen, [who/whom] I love more than words, is a terrible cook. [Who/whom] let the dogs out? MacGregor is the gardener [who/whom] is having trouble with rabbits. MacGregor is the angry gardener [who/whom] Peter told you about last week. [Who/whom] is your favorite Beatle? I don’t know [who/whom] to give this ridiculous hat to. Calvin’s older daughter, [who/whom] doesn’t like me, just passed the bar exam. Funnily enough, his younger daughter, [who/whom] I’ve been friends with since I was fifteen, is a bartender. Waldo, do you remember [who/whom] was there when you bought your first striped shirt? The masked man, [who/whom] I think is Luke’s father, has really bad asthma. [Whoever/Whomever] wrote me that anonymous letter is a coward. I don’t know why, but my brother always votes for the opponent of [whoever/whomever] I vote for. Remember to send the invitations to [whoever/whomever] should be coming to the party. But don’t send invitations to [whoever/whomever] we’re trying to avoid. For whom is this blog written? 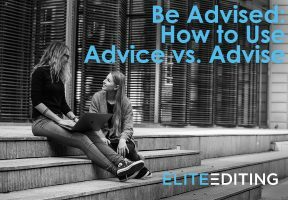 Why, it is written for all those who would like to have a deeper understanding of who vs. whom and when you should use who and whom. I hope that (whoever you are) you now feel totally ready to go out and use whom correctly in a sentence! And if you’re now wondering what the difference is between whose and whom, well, we have a post for that too.